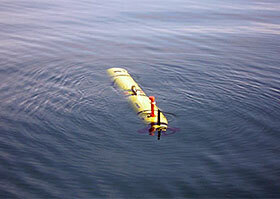 Most AUVs are currently launched from surface vessels, monitored from the vessel during dives, and then recovered. The convergence of improvements in battery technologies, on-board power management, efficient propulsion, lowdrag hull designs, navigation systems, and overall system reliability will soon allow vehicles to run for long periods without supervision—and will radically alter operational paradigms. For many missions, vehicles could be launched from shore, transit in a lowpower mode to a remote work site, perform a survey, and then return to shore completely on their own. With no vessel requirements and operational personnel needed only to monitor periodic updates obtained periodically via satellite when the vehicle surfaces, the costs for AUV operations will greatly diminish, thereby enhancing the usefulness of AUVs to science and industry.